Twelve years ago, Carolyn Riccardelli, '01, was working at the Metropolitan Museum of Art when Adam, a fifteenth-century marble statue, was severely damaged after its pedestal collapsed. Broken into 28 large pieces, and hundreds of tiny ones, the statue, the work of Italian Renaissance artist Tullio Lombardo, presented an enormously challenging conservation project. At first, Riccardelli was leery of taking on the project. Adam was considered one of the most important Italian Renaissance sculptures in North America. Looking at the marble fragments, Riccardelli felt the task was daunting. "At the time, I thought I wouldn't want to work on that in a million years," said Riccardelli, who was then working for the museum’s Objects Conservation Department as a contractor. However, when museum officials asked her to interview for the job, she realized the project fit her skill set perfectly. "I had worked on a number of big projects," she said. "And I knew I could deal with this one." She was right. Riccardelli, who was soon hired as a permanent staff member at the Met, worked in painstaking detail for more than a decade with a team that included three other conservators, a group of engineers and scientists, as well as a digital imaging specialist, to put Adam back together. The conservation treatment was so successful that it has been hailed as a case study for other conservators. And the project has garnered widespread news coverage including in the New York Times, the Wall Street Journal, and on CBS This Morning. Riccardelli credits the Met with protecting the conservators from the public eye and giving them the time necessary to restore Adam to its former glory. Now everyone can view the sculpture in a new exhibition, Tullio Lombardo’s Adam: A Masterpiece Restored at the Met through July 2015. Riccardelli said the public also can learn more by reading an article, of which she is the lead author, in the upcoming volume of the Metropolitan Museum Journal. 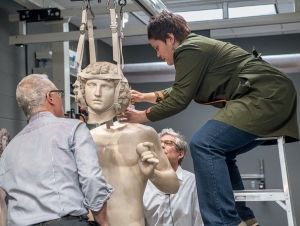 The article “The Treatment of Tullio Lombardo’s Adam: A New Approach to the Conservation of Monumental Marble Sculpture” documents the entire project and highlights the unusual collaboration between conservators and allied professionals.